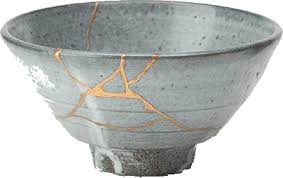 Kintsugi (or kintsukuroi) is a Japanese practice and refers to the repair of broken pottery. In this particular practice, a broken piece of pottery is repaired using a resin that is sprinkled with gold. The pieces of a broken bowl or cup of plate are bound together with this gold-sprinkled resin. The result is striking, as is apparent from the bowl pictured. When these pieces of pottery were originally crafted they were beautiful in their own right – they were crafted with care; they were functional; they were unique. But somewhere along the line they got broken. Perhaps they were treated carelessly – maybe banged down on a table in anger. Or perhaps they happened to be in the wrong place at the wrong time and were mistakenly sent tumbling to the floor. Whatever happened, the pieces ended up strewn across the floor. But someone cared enough to take these broken bowls – and to mend them. And the result is not a piece of pottery that is returned to its original condition. The result is not a bowl that is the same as it always was. Rather, the result of this repair work is a bowl that carries in itself the marks of the past – it has been broken, that much is obvious – it is scarred. But is it not the case that this bowl now has a different kind of beauty? Isn’t it the case that this is the same bowl, and yet not the same, since it is defined by a new, fresh aesthetic. A new beauty. Is it possible to express gratitude for this brokenness and this new beauty? It is interesting to remember that the disciples recognized the risen Jesus, in part, by the scars that mark his body. This tells us something significant about Jesus’ life and identity. The truth is that Jesus doesn’t have his resurrection life in some new superhuman body. Jesus does not have his resurrection life in a body that is purged of its history. Jesus does not have his resurrection life in a body from which the memory of pain and grief is erased. Rather, the one who is risen with us and for us is risen in the body in which he suffered with us and suffered for us. The vindicated one is the crucified one. The crucified one is the vindicated one. On this Christ the King Sunday, we recognize that our king is unlike any other. He is the suffering servant who, even now, bears the marks of his suffering. Notwithstanding his suffering and his scars, however, he is no mere victim – rather, the scars of the risen Jesus have become an emblem of his strength, of his reconciling love, and of his forgiveness. Through his scars we discover our own healing. We would never ask for suffering to befall us – and we would never choose to be scarred in life. Even more, we would never express gratitude for the sufferings we experience in life (and neither are we asked to). But we may just be able to express gratitude for the new beauty that Christ brings to our broken lives, as he draws our scarred selves into the glory of his beautiful kingdom. As we have been healed, we work for the healing of others. As we have received comfort, we extend comfort to others. As we have discovered freedom, we seek the freedom of others. Our broken, renewed lives may become a balm for others. Thanks be to Christ – a king like no other – whose scars speak to us of beauty and gratitude, and of new life. This entry was posted in Uncategorized and tagged christ the king, gratitude, healing, kintsukuroi, scars. Bookmark the permalink.